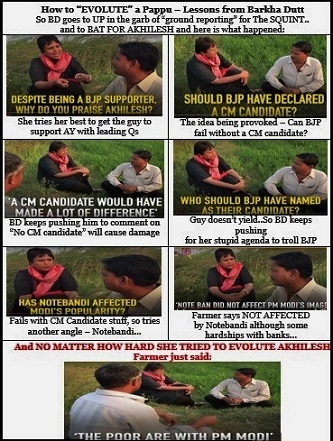 Despite her best efforts, Barkha couldn’t fool the farmer who knew who stood with the poor in reality. She kept pushing him to say that BJP will suffer badly without a CM candidate. I think the results are a big SLAP again for the “Evolutary” scientist. Pappu, Kejriwal, Hillary, Gurmehar, Akhilesh – Who next to Evolute? Who next to destroy? What is it that rankles with these people? If you ask me, there is not much real difference between BJP and the other parties as far as the practice of “socialism” is concerned. Either demonetisation has failed and there is anger among people or there’s some disguised Aaptard rooting for Kejriwal. These are not accidents or coincidences. These are organised campaigns to lure people into believing that their deliverance lies not with BJP but worn-out, pathetic corrupt outfits like Congress or SP or BSP – anything and anyone but the BJP. And part of the reason is Modi doesn’t feed the Commie Pigs as the Congress used to do. Akhilesh Yadav went as far as stating in public that journos will receive flying returns for their support to him. Worldwide, the Commie media is now becoming an object of contempt and ridicule. it only shows them up for the moronic fools they actually are. The ET footsies, in particular, had become slaves of Akhilesh, campaigning for him all over. There were even parody-handles on Twitter mimicking these folks who have surrendered their journalistic work-ethic to the crudity of money or value garnered by their bosses and their political preferences. How else can these jerks possibly go so wrong? Not even the ordinary man in our villages is so fooled as these people think they can fool the public. And the Congress footsies are eternal “Pallu-holders” of Sonia or Priyanka. Their Little Pappu is wasted – so their next Royal “hand-out” queen is the one to protect. The “Barsati Mendak” came and went and nobody even noticed. Amethi saw major losses for their little Kingdom too in these elections. But OH! 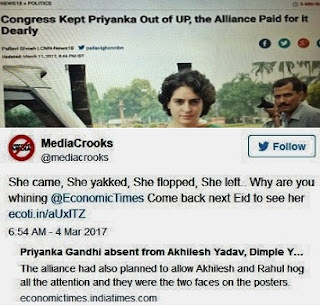 If only, Priyanka had campaigned a bit more – the tide would have turned and Congress would have pulled off nearly 9 seats – a 50% jump over the 6 they scrapped the barrel with. What kind of slaves talk this language? It’s not as if they great Priyanka Vadra didn’t campaign in 2014 either. She even jumped over a pile of bricks to show her electoral prowess. Congress still ended up with zilch in UP then. The story is no different now. Congress must die or they should get rid of these Chinese Gandhis who have no connection with Indians anywhere whatsoever. Their sole clean victory in Punjab is much thanks to Capt. Amarinder Singh and nobody else. Also, because the SAD-BJP combine faced anti-incumbency, and like the Congress, the Badals are a useless dynasty, soaked in as much corruption and non-performance as the Congis. I have stated many times, that the BJP with its growing might should not play second-fiddle to a regional party. Maybe next time in Punjab they will do a Maharashtra and go it alone. It’s better to lose for your own sins than the sins of your ally. I agree with that. The Sickulars are nothing but a bunch of spoilt, elite brats whose chocolate and cake have been stolen by Modi. He has rendered their Chinese Gandhis useless and also their secondary preferences like SP or AAP. From the Dadri “Intolerance” campaign to the latest Kanhaiyas and Gurmehars they have tried every brick to throw at him. They made out demonetisation as an evil that harmed the poor but even that failed. They even screamed “Emergency, Emergency” over demonetisation. The Sickulars in media have not proved to be good learners. end up digging their own graves. I call it the Sickular Kabristan. People are not going to drink the sand anymore. They don’t want hand-outs and doles. They now seek proof of performance and are far more demanding. In this context, Modi at the Centre and BJP govts in many states are giving a fair bit of proof. While there were elections in other states, the significance of the devastating effect the UP results are going to have on politics in India cannot be understated. Those who live in denial will find their rightful place in the Sickular Kabristan. Modi's Development agenda and Subramanian Swamy's hindutwa and Ram mandir agenda like a double edged sword helped BJP win so handsomely geting 3/4th seats in UP and UK. Nobody can deny Swamy's contribution catalysted by likes of Adityanath and methodical work of Shah. Ravinar, I am very happy for India and BJP. Hypothetically what would you have written if the results went the other way. He had bash them same as he is doing now . Ravinar doing his duty showing us hypocrisy of some people , especially media people. Congratulations to Ravinar and all friends here! Fantastic . U have striped naked these Fake news peddlers. 4th point about BJP is that by & large they have more nationalistic outlook & genuine patriotism than other parties. May be because of RSS influence. Though there are rotten eggs also who are selfish & unthinking. Thanks to the ever vigilant social media the conspiracies of sickular prestitutes are biting the dust. Wonder how many Sickulars/#presstitutes on their way to Kabristan read this.... If they do and are willing to learn and change, you would end up with nothing much to write about anymore Raviji! And that would be a big loss for us who learnt so much from your blogs... One in honour of our Guruji @Swamy39 is overdue... his contribution in destroying the Congress crooks and the Sickular Jamaat is immense... Jai ho! They still have one leg in London, an arm in Saudi Arabia and their private parts in Washington!!!! Very well summed up election results. Media today is like a duffer reading from handouts and knowing question paper before exams. However a smart board changes the paper last minute and they have a bad result. No touch with reality but writing or speaking like HMV. There is money and corruption everywhere and media too is soaked in paid news peddling. However they are so hot red-faced now that we don't see eggs on their face but full fry omelette. 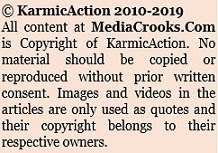 I do not understand why they have not got rid of stinking garbage like Menaka,Varun,Shatrughan & Kirti etc till date? Absolutely stunning commentary on sickular politics and sick media. Somehow I tend to believe media, Commies and opposition is falling into trap laid by Modi by making every decision of his about nationalism,Anti corruption and pro poor!! So you abuse him at your own peril since you will stand aloof from public. "It’s not as if they great Priyanka Vadra ..." should read "It’s not as if the great Priyanka Vadra". Not to pick holes, but your write-ups are so perfect that I have rarely seen a typo like this. People did suffer because of Demonetisation, but is this the only suffering they face daily (especially poor). The narrative attempted to project sufferings was an idiotic exercise. A party that won 225 seats in 2012 is giving 105 seats to a party with less than 10% percent vote share. The result is known there itself,surprised these so called reporters cannot gauge. "Media crooks" is the apt name you have given to such people.Govt should take serious action on such paid news. There is another term too for such gutter life. Presstitutes. Hope Ravinar, Modi, Amit, Swamy etc. will clean up the dirt in the BJP too i.e. 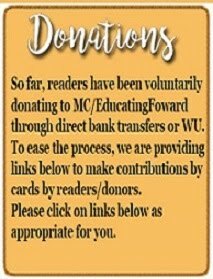 the wretched Lutyenites and Trojan horses cabal. Arun Jaitley sat on stage while celebrations were going on as a highly disconnected person - his being non achiever there. Lets see when & how BJP lutyenites walk out / kicked out. One thing struck a chord yesterday whilst listening to Narendrabhai at his speech. He specifically mentioned the burden of taxes,( rather carrying the economy of India ) on the Middle Class, that why should they!? His specific pointer to getting the poor to be self sufficient & contributor to Indias growth was a very pertinent point. I believe his subtle suggestions get overlooked in the clamour of Noise the so called intellectual MSM are making of Muslim Muslim Muslim. Markandey Katju had said that AAP will get thumping majority in Punjab. If proven wrong he will shave his head. Still waiting for him to fulfil his promise. Kejri is likely to go to katju's house with a blade and do the shaving ceremony himself. I am very happy for the u.p elections as this signalled the end of a very lazy and a corrupt government and the rise of a new Uttar Pradesh as the largest state in Indian republic with economic prosperity as a possiblility since the independence of India. On a sidenote however I would like to talk about Hindutva here and what ordinary Hindus miss when they talk about Hindutva. Let me jump straight into the core without much fact and figure detailing. Hindutva is a sort of vague political nationalism and an ideology created by veer savarkar which wanted to unify India as a nation state from Afghanistan to Burma as akhand Bharat. This concept Is purely based on political patriotism with allegiance to any govt or ruler or a political party who sees India as a geographically united entity from Afghanistan to Burma. This has Nothing to do with Hindu religion or culture which itself is a misnomer because the British baffled by contradictory cultural and religious systems in India coined the term Hinduism to collapse all diversity under a single category for effective political control and religious scholarship. IF HINDUS realize that Hindutva has nothing to do with religion or Indian culture and no political party would do anything to protect Hindu or technically Indian cultural or religious traditions then people would start doing something for themselves instead of looking at a leader or a govt to work with religion because govt is a secular system in a democracy. It has nothing to do with culture or traditional values of a sect. Hindutva is basically political and economic nationalism allowing even a Muslim or a Jew or a Christian to be Hindutva vaadi if they are Indian citizens and favour a particular political party. I hope people realize this or else India would become a shadow of the Western civilisation with bits and pieces of its traditions surviving in the near future. I hope truth prevails and my comment is not deleted. Social engineering or playing with EVMs or repaying Khangress with their own techniques (remember Year 2009 general election manipulation of EVM's), it is excellent UP result. Neerja Choudary - 100% depreciated journalist. 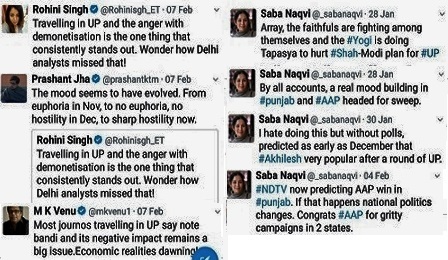 Saba Naqvi suddenly changing her chameleon views. Milky Ghose rumblings on Economic Times (business channel) was silenced by her own colleague. The best commentators were on ZEE News channel & ABVP channel who took regular round robin pot shots atleast for one day on 11-Mar-2017. 100 din praja ka, Ek din Sultan Ka !!!!! No country in the world has rules that the country's top leader cannot go and campaign for state or even Municipal government in his/her own country. Having said that we may not find any leader of the country holding so many rallies as Narendra Modi had done in UP election. But then again you may not find as energetic leader as Narendra Modi (who has not taken a vacation in so many years). If I were a Leftist, Secular opposing Mr. Modi, the first thing I would do is, agree wholeheartedly with Mr. Modi's suggestion of holding all state and central government election simultaneously. That way, I can prevent Mr. Modi 'steal' the election with popularity because what happened in UP will happen in Bengal, Tamilnadu and other states. And we in opposition have no answer to his popularity. सदा की तरह अप्रतिम, मार्मिक और संवेदनहीन मूर्ख शत्रुपक्ष पर प्रहार!! Amit shah used to say in his all interviews " you dont know the ground reality " whenever cheap questions asked by commie journo. Now i feel that this delhi media dont know reality , dont serve truth just running their own agenda , misleading public , thanks for such blogs which talk on facts.